Sulawesi Bay is a deepwater bay with a central flat atoll surrounded by low hills. An outlying territory of Tamita State, Sulawesi Bay shares the same latitude as Manatu Island in the far south of the Irukandji Continent. The terrain of Sulawesi Bay was hand terraformed, and loosely based on the template of Baie de l'Amore. Soon after, the Sulawesi Bay template would be used as the basis for the faraway region, Sunset Shoals. Sulawesi Bay had a single large landowner from the US who occupied the central island. 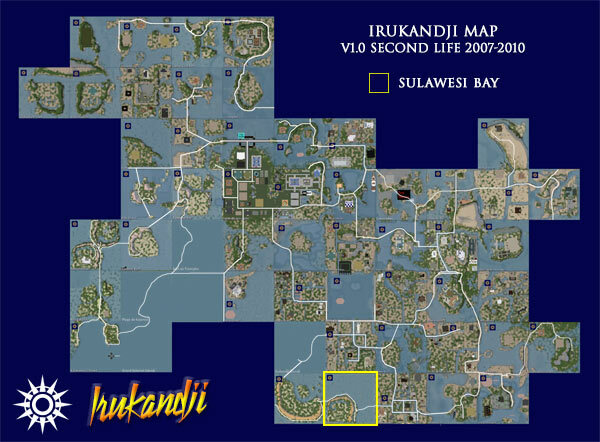 The region was traversed by the Trans Irukandji Causeway which ran east-west from Manatu Island to Kebo Atoa. Neighbouring regions that adjoined Sulawesi Bay were Kebo Atoa, Irukandji Sound, Pinjarra Island, Tiamo Reef, and Manatu Island.